OW Developmental Cycles are made to improve professionals whose mission is to influence others so that the company improves its results and professionals gain the respect of others. OW has a BUSINESS Division with job-specific programs that are especially adapted to each company and, for which, we have become the market leader. OW has a FINANCIAL INSTITUTION Division with job-specific programs adapted to Banks and Savings Banks and, for which, we have become the market leader. OW has an Executive Training Division through which open modality cycles are given for individual training of company directors and sales reps.
OW offers, among others, the following services: team bonding, conferences, coaching and workshops for improving motivation, the working climate and reaching professional objectives. The OW Developmental cycles are for achieving real improvement in every person whose mission in a company is to mobilize and influence others, enabling them, through the quality of how they treat and manage others, to achieve better results for the company. This means improving the professional behavior of directors and managers as well as that of the sales team. The group it covers includes Top Management, directors and intermediate supervisors throughout different company levels and departments. Each case adapts to each company’s reality and management level.Otto Walter is an essential partner in putting Top Management’s vision into action, through professional behavioral development in those people who are key to mobilizing others. Otto Walter is an essential partner in putting Top Management’s vision into action, through professional behavioral development in those people key to mobilizing others: Directors and the sales force. The OW Developmental cycles are for achieving real improvement in every person whose mission in a company is to mobilize and influence others, enabling them, through the quality of how they treat and manage others, to achieve better results for the company and, in the end, lead and manage their teams and themselves better. For those people in a company who DIRECT and LEAD OTHERS. The group includes people in Top Management, directors and intermediate supervisors at different company levels and in different departments. The Executive Cycle of Leadership and Personnel Management is designed to help those professionals in positions involving team supervision to perform their duties and mobilize others more effectively by using their own behavior and treating their team well. Ultimately, so they can lead and manage their team’s knowledge better and take full advantage of its talent. Each case adapts to each company’s reality and management level. Adapted and personalized to each project, objective and company. Directors complete four months of work that are made up of five intense and measured workdays in highly interactive groups that are directed by an OW expert trainer and interchanged with periods of CPE® including conscious on the job implementation, online tutorials and homework. During the development of Cycle, attendees will fulfil an assessment of their managing behaviour quality, that consists in a double measurement: on one hand, each manager self-assesses and, on the other hand, he or she will be evaluated by his/her straight collaborators. Once completed, a final report will be obtained. With these results, the trainer and the participants will work on the analysis and development of the conclusions obtained. Specific tools to delegate and develop teams with. Conscientious self-control in exercising leadership. Improvement of upward and downward proactive influential skills. Better personal and team results. Better relations with the team in a very demanding, but also positive, environment. Development of team strengths and responsibilities. More involvement and performance from the entire team. Order and clarity of ideas, tools and concepts with which to direct people. Practical, specific behavior to always stay in-sync with the basic principals of leadership. Increased commitment of others with their own decisions. Effective management of time and people. A shot of positive energy to the company. Directors who have already completed Executive Cycle 1 for Directive Development. Taken one year after completing the first Cycle, this cycle works mostly on mastering the conscientious use of the tools acquired and on time management. Managers complete two months of work that are made up of three intense and measured workdays in highly interactive groups that are directed by an OW expert trainer and interchanged with periods of CPE® including conscientious on the job implementation, online tutorials and homework. Cycle 2 includes a 180º Assessment of Management Behavior Quality, online tool developed by OW International that consists in two evaluations: on one hand, competences and skills about his/her daily management behaviour are measured, in order to identify what is being done well and what should be improved. On the other hand, appreciation and prestige as a boss has been reached in his/her team will be assessed as well. Both signs together make up a really reliable map of his/her Management Quality, figuring out strong and weak points of manging style. The joint process of Cycle 1 and Cycle 2 brings about higher and more impactful development that gives executives clear behavioral alternatives that help them manage and lead at the levels currently expected of them. Each participant becomes clearly and proactively aware of those aspects he or she does well and is more motivated to work on those that are not done well, receiving clear tools with which to progress. Real, lasting changes are seen that bring about clear improvements in how one directs others and, at the same time, a much higher awareness is achieved in exercising appropriate behavior and better self-control and direction. Directors clearly express their satisfaction and self-confidence as they begin to better understand and dominate personnel management and manage situations that it entails more successfully. For qualified professionals in positions of responsibility and influence of others (upward, horizontal, etc. ), but with no collaborators under their direct supervision. The basic objective is achieving changes that improve and change everyday habits to bring about a true evolution in the exercise of professional leadership. In essence, throughout the different sessions, this OW Cycle is an evolutive process that combines all project and personnel management situations and elements in a practical and participative way that can be immediately applied to everyday reality. The cycle covers one and a half months of work that are made up of three intense and measured workdays in highly interactive groups that are directed by an OW expert trainer and interchanged with periods of CPE® including conscientious on the job implementation, online tutorials and homework. Development of entrepreneurial behavior and proactive participation. Improvement in planning, control, follow up and accomplishment of objectives. Development of initiative, ability to innovate and day-to-day creativity. Promotion of a higher sense of responsibility focused on each professional feeling actively part of a project. Coordination and specification of tasks and vertical and horizontal objectives. Promotion of interdepartmental teamwork and an overall BUSINESS perspective. A focus on a new environment and on oneself to find solutions and not problems. Development of positive, flexible attitudes that are open to change. Use of improved communication at all levels as a driver in relationships, influence and in the treatment of others. Increase in individual motivation and improvement in passing enthusiasm on to the area. Increased focus on higher performance, achievement and personal satisfaction. Improvement of time management quality and efficacy. Increased upward and horizontal influence through forthcoming values, ideas and solutions. Supervisors and line managers. For supervisors with limited responsibility and fewer than five people under their supervision. 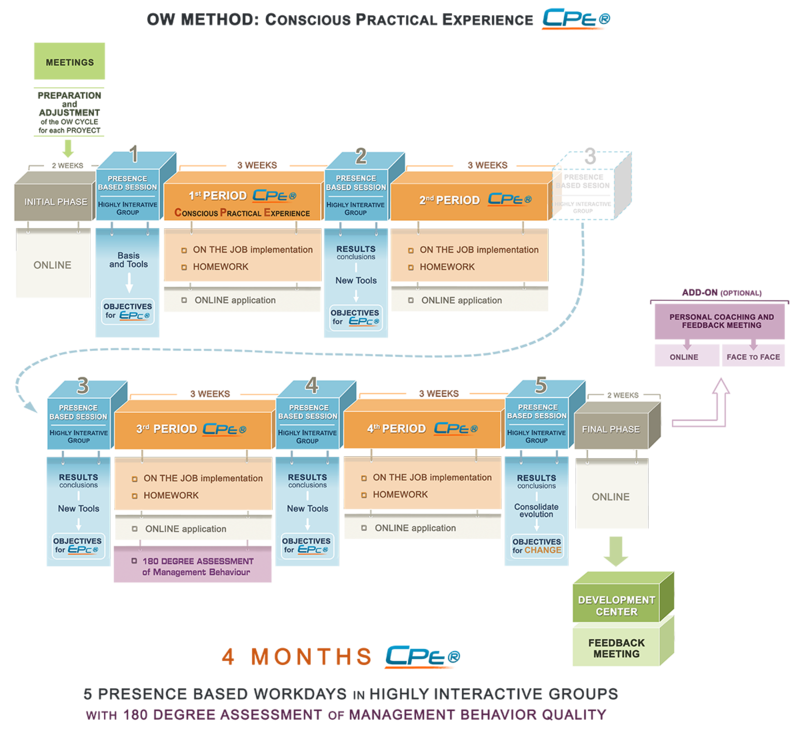 Compared to the PDP Program, this cycle has a lower level of transformation due to its lower content and only three periods of CPE® between sessions, enough for mid-lower profile Managers with limited decision-making. Achieve changes that allow for improvement and change in everyday habits in order to obtain true evolution in personnel management. Adapted and personalized for each project, objective and company. Directors carry out three months of work that are made up of four intense and measured workdays in highly interactive groups that are directed by an OW expert trainer and interchanged with periods of CPE® including conscientious on the job implementation, online tutorials and homework. Tools for communication and influence. Leadership harmony: Delegate and Command. More effective meeting participation and direction. Motivation and Development: positive and constructive feedback. Helping those working in sales sell more and better. Otto Walter has vast experience and success in developing and strengthening sales teams and departments. The Cycles adapt to the needs and characteristics of the interested organization by previous analysis. For experienced Sales representatives who work in business-to-business, meaning professional sales between companies or top-level direct sales consulting. It covers all aspects and situations that affect the sales process and a professional sales rep´s day-to-day. The main objective is to develop the behavior, attitudes and selling style of the sales force through high level activity, bringing about more proactivity, excitement and enthusiasm. Self-improvement is seen every day and stems from their own resources and knowledge, guaranteeing successful results.. Adapted and personalized for each project, objective and company. Carried out during four months of work that are made up of five intense and measured workdays in highly interactive groups that are directed by an OW expert trainer and interchanged with periods of CPE® including conscientious on the job implementation, online tutorials and homework. Confidence and motivation to sell. Better exercise of self-controlled sales behavior. Improved communication skills at all levels. Development and understanding of key tools for good sales management. Improved ability to influence clients. Better personnel planning and organization of your sales area. A much more proactive and positive attitude. Improved efficacy in making appointments. Control of difficult situations with clients. Development of an ability to understand the client. Better advantage is taken of opportunities to win a client over. Improvement in objective and action specifications. Direct sales managers and sales reps working directly with the final client, often meeting with them at their own facilities. Focused more on direct contact with the client. Adapted and personalized for each project, objective and company. 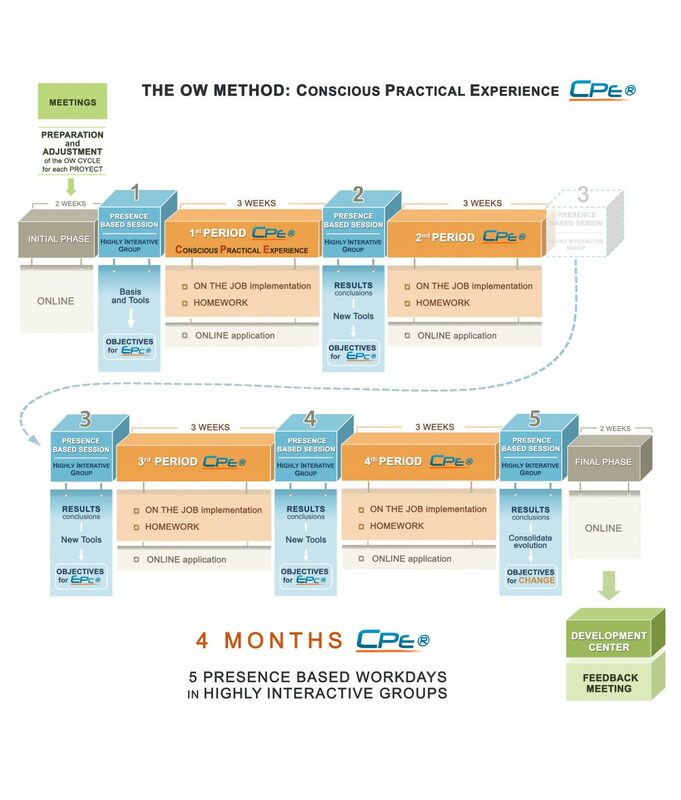 Transformation over three months of work that are made up of four intense and measured workdays in highly interactive groups that are directed by an OW expert trainer and interchanged with periods of CPE® including conscientious on the job implementation, online tutorials and homework. Boosted positive energy helping to maintain a more proactive attitude. Reorganization of previous knowledge and experiences. Progress in day-to-day efficacy and in exercising professional sales. For those who actively participate in sales without being sales representatives themselves, working with clients and servicing them and, in some cases, even making sales. They detect unmet needs, respond to claims, and, in all cases, “sell” the company’s image and quality of service. This Cycle is especially directed to post and/or pre-sale professionals as well as technical service and customer service professionals, among others. The main objective is to bring about development of conscientious behavior, attitudes and activity planning in post and/or pre-sales professionals as well as in technical service and customer service professionals, resulting in complete customer satisfaction and proactive client recommendation of the company. Adapted and personalized for each project, objective and company. Covering two months of work that are made up of three intense and measured workdays in highly interactive groups that are directed by an OW expert trainer and interchanged with periods of CPE® including conscientious on the job implementation, online tutorials and homework. Better sale of image and more and better information gathering. Our Cycles are especially recommended to make Strategic Plans reach fruition for those financial institutions focused on improving their productivity, sales efficiency and collaborator-profitability ratios, meaning those who believe people are key to competitive development. The contents adapt completely to the world of finance and have an absolutely PRACTICAL and REALISTIC focus that is based on specific cases and situations in the day-to-day activity of a bank or financial institution. For those who DIRECT and LEAD PEOPLE, including Top Management, directors and different central office department supervisors, Territory Directors, Area Directors, Unit Managers, Zone Managers and Large to Mid-sized Office Directors. The cycle adapts to reality at each directive level. This Cycle is focused on helping those professionals working in team management to perform their duties and mobilize others more effectively by using their own behavior and treating their team well. It is specially designed for all directors and managers that lead the day-to-day activities of financial institutions, banks and credit or financial cooperatives. Ultimately, so they can lead and manage their team’s knowledge better and take full advantage of its talent. Adapted and personalized for each project, objective and company. Directors carry out four months of work that are made up of five intense and measured workdays in highly interactive groups that are directed by an OW expert trainer and interchanged with periods of CPE® including conscientious on the job implementation, online tutorials and homework. Real and coherent exercises in leadership. Overall understanding of the job of directing people. For Top Management, directors and different central office department supervisors, Territory Directors, Area Directors, Unit Managers, Zone Managers and Large to Mid-sized Office Directors that have already completed Executive Cycle 1 in Management Development. Carried out at least 1 year after the first Cycle, this cycle mostly covers conscientious use and perfection of the tools acquired as well as general time management. Directors complete two months of work that are made up of three intense and measured workdays in highly interactive groups that are directed by an OW expert trainer and interchanged with periods of CPE® including conscientious on the job implementation, online tutorials and homework. Cycle 2 includes a 180º Assessment of Management Behavior Quality, online tool developed by OW International that consists in two evaluations: on one hand, competences and skills about his/her daily management behaviour are measured, in order to identify what is being done well and what should be improved. On the other hand, appreciation and prestige as a boss has been reached in his/her team will be assessed as well. Both signs together make up a really reliable map of his/her Management Quality, figuring out strong and weak points of manging style. The joint process of Cycle 1 and Cycle 2 brings about higher and more impactful development that gives directors clear behavioral alternatives that help them manage and lead at the levels currently expected of them. The skill of directing others is more instinctive than meditated and is acquired, somehow, through each person’s everyday experiences. With the Otto Walter Cycle one realizes that the “how” consists in applying a series of logical and simple concepts that we all have in mind and that, through experiencing the cycle, we can all learn to use”. The OW method is practical and can be immediately implemented; results are seen in a very short term. The positive change for focusing a team’s direction makes these sessions something that any company, any employee should, and I would like to emphasize should, attend, promote and carry out so as to achieve a significant improvement in their business. For central service technicians. This cycle is tailor made to reflect the reality of central service in financial institutions, for qualified central service professionals that are in positions of responsibility without people under their direct supervision. The main objective is to achieve changes that improve and change everyday habits in order to achieve true evolution in exercising professional leadership. In essence, this OW cycle consists of an evolutive process that brings together, throughout all of the sessions, every element and situation seen in project and personnel management in a practical and participative way that can be immediately implemented in everyday reality. One and a half months of work are carried out that are made up of three intense and measured workdays in highly interactive groups that are directed by an OW expert trainer and interchanged with periods of CPE® including conscientious on the job implementation, online tutorials and homework. OW has a BANKING Division with job-specific programs adapted to Banks and Savings Banks and, for which, we have become the market leader. These work programs are tailor made to the reality of sales representatives and directors in financial institutions and focus on everyone who contributes to optimum sales progress. OW Cycles are especially recommended to make Strategic Plans reach fruition for those financial institutions focused on improving their productivity, sales efficiency and collaborator-profitability ratios, meaning those who believe people are key to competitive development..
For head sales representatives (office directors, specialized sales managers, portfolio managers, personnel managers, etc. as per each case and company). The cycle covers all aspects and situations that affect the everyday sales activity of financial institutions. Unlike other OW Trade programs, this one covers areas such as negotiation, organization of time, territories and sales activity action plans, setting appointments as well as behavior equality with one’s top-level counterparts. The main objective is to develop the behavior, attitudes and selling style of the sales force through high level activity, bringing about more proactivity, excitement and enthusiasm. Self-improvement is seen every day and stems from their own resources and knowledge, guaranteeing successful results. The Otto Walter cycle should be given to any employee who has a team of people under their supervision. It increases work quality and client service. It improves the office working environment and motivates you to take on challenges and take initiative where you had never thought of doing so before. Considering the current market situation, participating in the Otto Walter cycle has helped me gain confidence in my work and, especially, in client appointments, mostly because now I prepare my appointments more, I think I make more emphasis on watching how I express myself both verbally and through my body language. I not only want to sell, as was the case before, but now I structure my interview with the best questions to be able to take away a more complete perspective of the client. This is a special POST- PDP Sales Cycle for office Directors and Managers who have completed the OW Cycle for Director Development. This cycle level is equivalent to the Sales Activity Superior Cycle and is adapted and personalized for each project, objective and company. 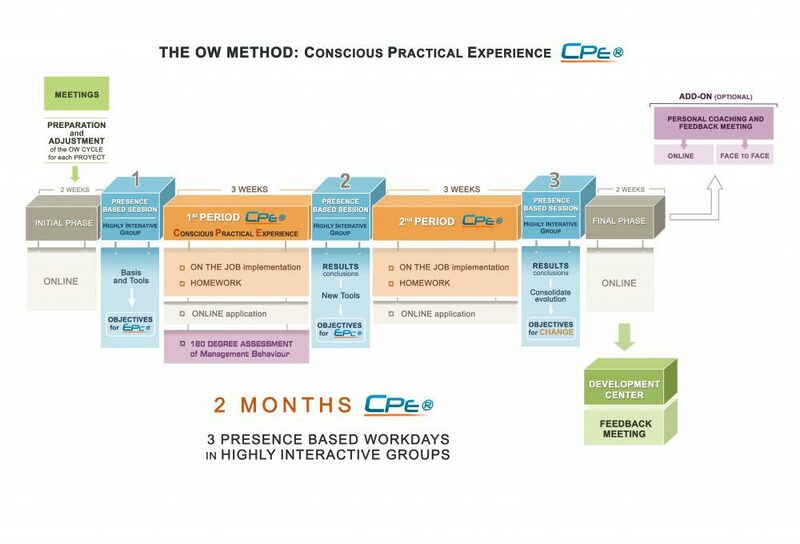 Transformation over three months of work that are made up of four intense and measured workdays in highly interactive groups that are directed by an OW expert trainer and interchanged with periods of CPE® including conscientious on the job implementation, online tutorials and homework. During these four days I have had time to work, enjoy myself, think…but, above all, I have been able to get to know my own behavior and train myself in behavior and sales techniques that are usually not developed and, more importantly, I was able to see the mistakes I make in my day-to-day sales activity, sometimes due to habit and others to lack of knowledge. This method really helps sell and be successful but I would especially emphasize how good it makes us feel about our profession and how much it makes us enjoy it. SALES BEHAVIOUR AND PROACTIVITY DEVELOPMENT CYCLE FOR FINANCIAL INSTITUTIONS. For other sales activity managers: Mid-level sales managers and Comptrollers (Sub-directors), office sales personnel working directly with the final client, both inexperienced sales reps and office personnel who normally receive clients. Focused more on direct contact with the client. The main objective is to develop the behavior, attitudes and selling style of the sales force through high level activity, bringing about more proactivity, excitement and enthusiasm. Self-improvement is seen every day and stems from their own resources and knowledge, guaranteeing successful results. This cycle is different to the previous one in that it does not cover subjects such as negotiation. Daily progress in efficacy and making professional sales. It is extremely useful for all sales managers because one of its main objectives is introducing us to the necessary tools for each and every office member to be able to work as one great team. The sessions are filled with practical content regarding behavioral training in sales through the conscientious use of each of the tools that, although not perfect, help reach the proposed sales objectives. The main objective is to bring about development of conscientious behavior, attitudes and activity planning in professionals that ultimately results in complete customer satisfaction and proactive client recommendation of the company. Adapted and personalized for each project, objective and company. Carried out over two months of work that are made up of three intense and measured workdays in highly interactive groups that are directed by an OW expert trainer and interchanged with periods of CPE® including conscientious on the job implementation, online tutorials and homework. Increased work quality and client service, improved office working environment, encouragement to take on challenges and take the initiative, things that I never considered before. All of the experiences I have acquired and shared with others during each session have enriched my development as a sales rep. In some cases I have improved those techniques I already knew and in other cases I have been able to acquire new ones. The true discovery of the course, for me, has been the conscientious application of these technique-tools. Isabel Lores Suárez – Canary Island Territory Director. Tinsa. The OW diploma is earned for 110 hours that are certified by OW and corresponds to a SPECIALIST level. OW Open Programs are groups made up of various participants from different companies and are organized homogenously based on the group level. * We'll call you to offer only the information you request us. For Directors and Managers of large and mid-sized companies and SMEs with a minimum of two year’s experience in personnel management. The OW Cycle 1 in Leadership and Personnel Management enables Directors to better lead and direct others by contrasting professional behavior with a method of transformation and perfection. OW expert trainers with more than fifteen years of experience in management and sales in both national and multinational companies. From sales reps to CEOs at the most important businesses, they are exceptional spokespeople at any level. Carried out over four months of work that are made up of five intense and measured workdays in highly interactive groups that are directed by an OW expert trainer and interchanged with periods of CPE® including conscientious on the job implementation, Online tutorials and homework. 180 degree Assessment of Management Behavior Quality. This Cycle includes this online tool developed by OW International that consists in two evaluations: on one hand, competences and skills about his/her daily management behavior are measured, in order to identify what is being done well and what should be improved. On the other hand, it is evaluated the appreciation and prestige reached among his/her team. Both signs together make up a really reliabe map of his/her Management Quallity, also detecting strong and weak points of management style. For experienced sales representatives who work in business to business, meaning professional sales between companies. The OW Superior Cycle 1 in Sales Representative Behavior enables sales reps to make more and better sales by contrasting professional behavior with a method of transformation and perfection. Directors carry out four months of work that are made up of five intense and measured workdays in highly interactive groups that are directed by an OW expert trainer and interchanged with periods of CPE® including conscientious on the job implementation, online tutorials and homework. Team Cohesion and Consolidation meetings. Intense meetings lasting two consecutive days in which a specific group (Board of Directors, departments, etc.) will reflect on, experience, give feedback on and bring forth essential values and codes that the team wants to establish and reinforce to improve cohesion and performance. Convention, congress and company meeting support for moderating work sessions or communicating strategic messages through personal and live conferences. Expert Speaker: Paco Muro, President and CEO of OTTO WALTER International, named one of the top Spanish experts in management by Expansión, renowned motivational, sales and management speaker. Author of international best-sellers selling more than 300.000 books worldwide that are translated into various languages. Individual tool for developing, improving and reinforcing, in an operative way, the skills of each participant. Directive Coaching. An action and learning plan are set during periodical meetings with the Coach, guaranteeing that important advances for achieving professional objectives are seen. OW selects Coaches and Senior Advisors that can best help in each client’s case. An action plan is established that best adapts to the developmental needs of each director and an optimum criteria for each is applied: coaching, advising, monitoring, etc. For large groups that need a workshop or one-time specific training, OW offers specifically designed workshops in which a series of objective aspects are reviewed monographically, using OW language and techniques. Depending on the specific needs to be developed, the workshops are usually additional to OW Cycles.